Maine’s first public health nurse (PHN) was Edith Soule. She is second from the right in the picture above. In 1920, Edith was named director of the newly created Division of Public Health Nursing and Child Hygiene. Two years later she asked Governor Percival Baxter for funding to hire more nurses who could travel throughout the state. In 1923, a second nurse was hired. The primary role of the public health nurses was to improve the health of pregnant women and their babies and reduce the infant mortality rate. Over the years, the program grew and the number of nurses fluctuated, reaching as many as 100. In September 2017, there were only 10. Today, it’s estimated that there are about 16 public health nurses in Maine. Estimated, because no one I asked knew for sure. They were our army for addressing any kind of outbreak. We would send them to an outbreak location and they would investigate the source (with direction from us in Augusta) and provide guidance. They were instrumental in addressing a long tuberculosis outbreak in southern Maine. They would conduct vaccine clinics, either in an outbreak or other situations when needed. During the ice storm of 1998, they went door to door in the heaviest hit areas to make sure people were operating generators properly and were okay. After 9/11, they were more fully trained in public health emergency preparedness, and were indeed on the frontlines of anthrax threats, vaccinating people against smallpox, etc. They were some of the first responders to the arsenic poisoning in New Sweden in 2003. During an outbreak of the H1Ni strain of influenza in 2009, public health nurses organized and participated in 238 immunization clinics around the state. Keeping nurses in the program was a constant challenge. When a federal maternal child health block grant was cut (which happened repeatedly), PHN positions also went. When the state budget needed to cut a general fund position — to save money and/or use the position line for something else — PHNs were often the target. The annual report also pointed out that Maine’s Public Health Nursing Program had been granted full accreditation by meeting national standards of excellence as put forth by the Community Health Accreditation Program (CHAP), a nationally recognized accrediting body. “We were one of, if not the only one in the nation,” said the program’s former Director Jan Morrissette. The following year, 2011, Governor Paul LePage took office. It soon became clear to Jan, who had headed the Maine Public Nursing Program for six years, that there would be little to no support for the program under the new administration. She decided to move on. Her position was filled, but other open positions were not. Lindsay Luetje was one new mother who did not fit that profile but still benefited greatly from Sarah’s visits after giving birth to premature twins five years ago. During their 18-day stay in neonatal intensive care, someone recommended that she sign up for visits from one of the state’s public health nurses. She didn’t think it would be necessary but changed her mind once they got home. 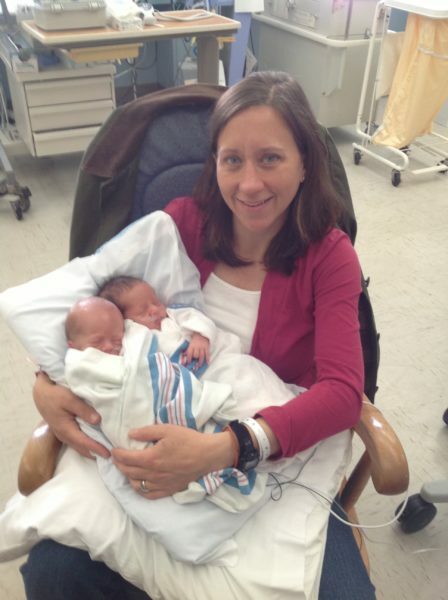 Caring for the babies and not getting enough sleep was often overwhelming for Lindsay and her husband and the pediatrician also wanted them to have weekly checkups in the beginning. That’s when Sarah stepped in. Sarah left Maine’s Public Health Program in 2014. She had two small children and her work — all the traveling she did to help Maine families — presented some challenges for her own. In late 2015, in a different job, she reached out to the Public Health Nursing Program to discuss collaborating on a project. At a public hearing before the Legislature’s Health and Human Services Committee in April 2017, 59 people testified. Fifty-eight spoke in favor of the bill. The citizens of Maine expect their Public Health Department to identify contagious diseases and they expect to be protected. To provide this protection, Public Health Nurses are the vital link in protecting all of us when outbreaks occur and outbreaks will occur. Dr. Stephen Sears, former state epidemiologist. If I had everything going for me and I needed this valuable help, can you IMAGINE what kind of impact Sarah’s (and her colleagues) work has on a family in much different circumstances? Lindsay Luetje. One person spoke against the bill — Dr. Christopher Pezzullo, State Health Officer. Due to concerns this bill would be costly and harm existing collaborative efforts, the Department of Health and Human Services is in opposition to this bill. I reached out to Dr. Pezzullo for further explanation, but have not yet received a response. The new law mandated the Maine Department of Health and Human Services (DHHS) to fill not the 59 positions that were in the original bill, but 48 positions that were already funded and budgeted for the current fiscal budget. The deadline for filling the positions was March 1, 2018. In February, DHHS Commissioner Ricker Hamilton indicated that nine positions had been filled. He also noted in a mandated report to legislators that Maine is experiencing a nursing crisis and that DHHS had partnered with the University of Maine System and the Maine Nursing Action Coalition to try and address the situation. He said that despite the crisis, his department continued to make progress in complying with the new law. I reached out several times to DHHS asking for an interview with Ricker Hamilton. DHHS spokeswoman Emily Spencer responded earlier this week, asking for my questions. I have not yet received any answers. If I get responses from Dr. Pezzullo and/or Ricker Hamilton or any other additional information, I will update this blog post. The next segment of Nurses Needed runs Friday, May 11. In honor of nurses week, we’re going to show our nurses a little love. If you have a story you’d like to share about a Maine nurse, send it to me. 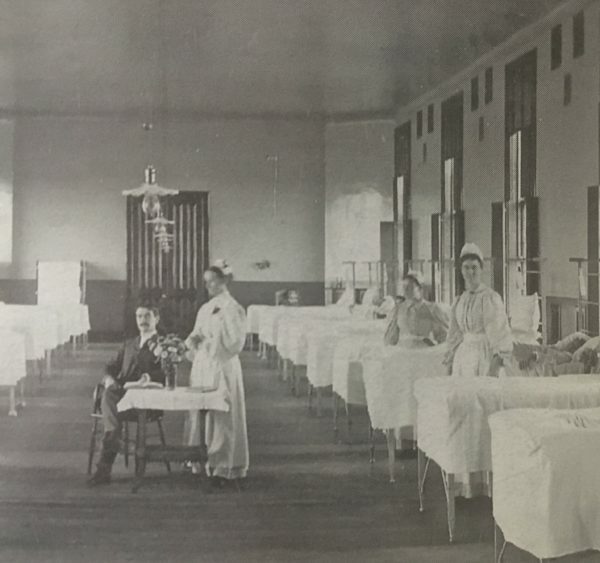 Monday, May 14, we’ll wrap things up with a look back at the history of nursing in Maine.